Empyreal Nocturne is a third-person aerial action game in which you combat enormous flying objects by commanding a legion of birds. These objects are connected by orbs, which are fiercely defended by birds of its own. 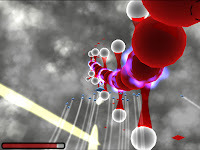 Defeat each creature by destroying their weak points, then fly into a portal to access the next stage. Use the W, A, S and D keys to navigate your ship, or press the space key for a temporary speed boost. This move is limited to the number birds you have accompanying your ship, though these will replenish automatically as time passes. The mouse wheel can be used to switch between attack and defense mode. Hold the left mouse button when you have acquired a target to queue missiles for launch. Restore energy by pressing the right mouse button, and use the C key to switch camera mode.